Aluminium’s share of the trailer boat market is dominant, yet the fibreglass builders continue to introduce new models despite the significant cost of producing the moulds. Queensland builder Whittley has come up with a boat that, in concept, harks back to the 70s but in execution is right up to date. The Whitley 1650, at five metres or 16.5ft, is bang on length for the period but fits in its cuddy leaving vastly more cockpit than its ancestor. Construction quality is infinitely better, as is the fit out. 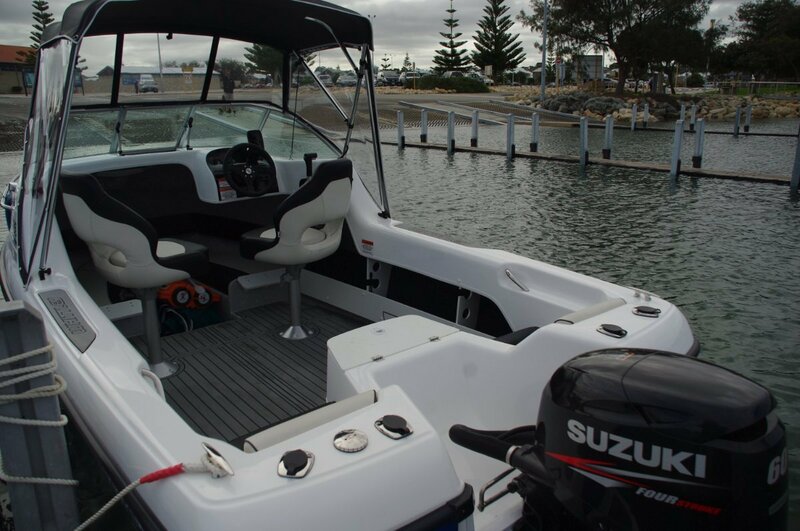 What has not really changed is what buyers of fibreglass trailer boats want to do with them: fishing, of course; take the family to Rottnest, definitely. And our review day indicated that both of those are well within the 1650’s capabilities. The cuddy cabin is understandably small, with headroom for adults only if they lean forwards. For children, though it is ideal. Up to a certain age they seem to prefer playing indoors at sea; they could even sleep in here. The large hatch in the roof hinges open up to the windscreen, the centre section of which also opens. The cuddy is really the extravagantly raised foredeck of a runabout. Standing in the hatchway gives the deckie access to the anchor and berthing lines. The 1650’s deck is carpeted with a tough rubber-type carpet. The same material is recessed into sections of the coaming each side to give secure footing for boarding passengers, and at the same time protecting the gel coat. There is just one pair of rod sockets in the coamings – but above the side pockets are rod racks; a much harder handyman job to install than more sockets. They are roomy pockets, lined with carpet, and continue at a higher level to take the oddments of the pedestal seat occupants. 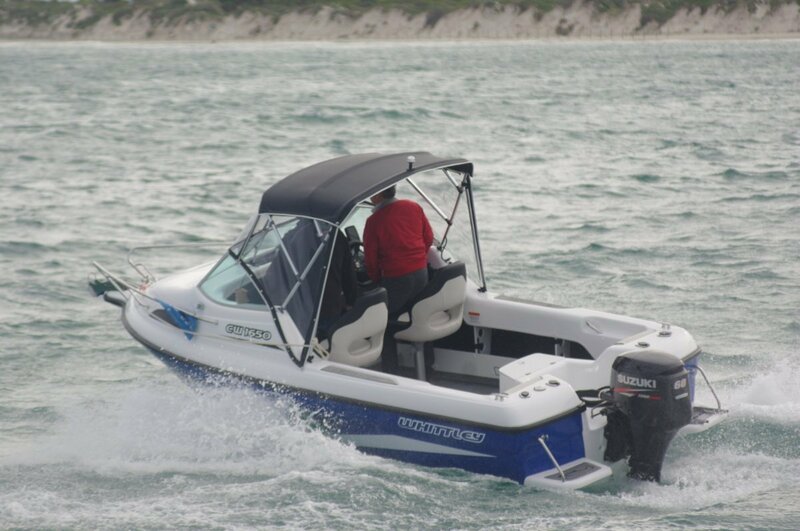 These are excellent seats, swivelling aft and outwards into pretty good positions for laid back anglers. There are two other seats on board, removable from their positions alongside the splash well. Projecting forward from the well is a bait tank. As fibreglass boats go the 1650 is priced for the economy market at $45,500, yet it is remarkably well equipped. Besides the features already mentioned, boarding platforms and ladder, Bimini plus front and side clears, Garmin Echomap GPS and two-way radio would account for a significant number of those dollars. This is a very easily driven boat. 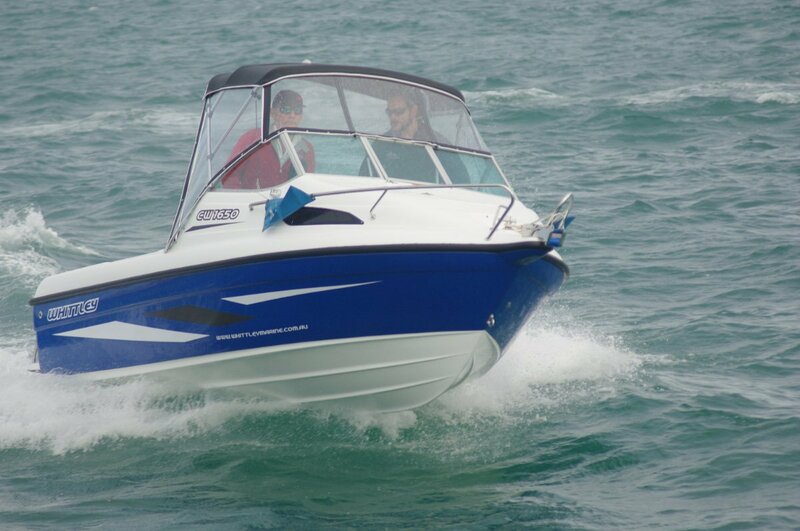 We were wearing the recommended 70hp and got so much performance from it that there would be little point in substituting the maximum 90hp. 50hp is the lowest suggested power, but it would almost certainly do an effective job. The review day was one when likely buyers of this boat would stay at home, and one when I would appreciate the clears that I usually find redundant. The Whittley proved a surprise packet, coping extremely well. 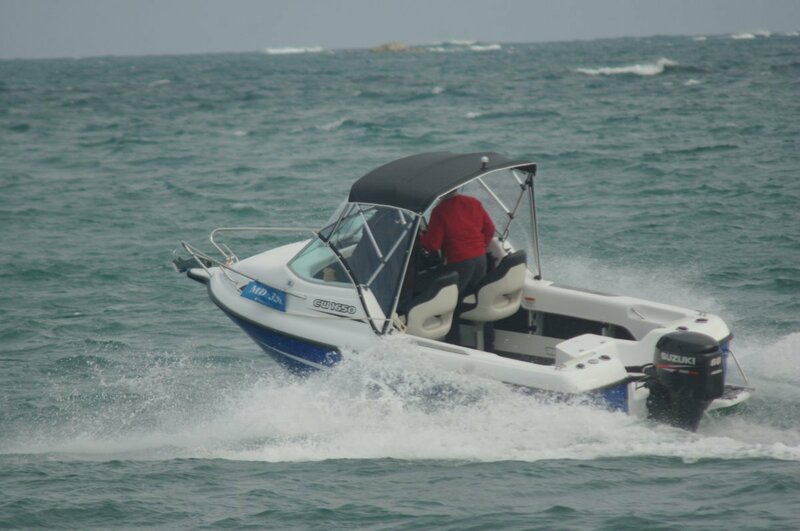 Spray, certainly, and plenty of movement, but on the other hand an unexpectedly good ride – helped most likely by the seats being mounted only a little way ahead of the boat’s longitudinal centre. Also, probably simply being fibreglass, and heavier than the equivalent aluminium boat played its part. The hull material certainly accounted for the quiet progress. In stability too the 1650 punches above its weight. With two of us standing, toes touching the side, thighs the coaming, the list it took on was insignificant. It achieved this not with a blunt bottomed hull but one with a respectable 16 degree deadrise. MacKay trailers come as standard with Whittley boats, the current generation having built-in tie downs. These are excellent items, one each at the quarters and bow; ratchet powered and far simpler to operate than the average strap mechanism. Having them built in makes them much likelier to be used. Not many people do secure the rear of their trailer boats, and light ones tend to squirm. Towing over rough stuff can make them bounce. Wear on the boat is accelerated, and we see the occasional news picture of a boat that has completely departed its trailer. Towing that loaded trailer is within the capacity of most medium sized cars, with an unladen towing weight of about 1,200kg.